The private pilot was landing an amphibious airplane in the ocean waters of an inland cove. Photographs of the accident sequence showed the water conditions as relatively calm and glassy. The pilot reported that the airplane touched down faster than anticipated and before her intended touchdown point, which subsequently caused the airplane to bounce back into the air. Instead of continuing the landing, she attempted a go-around. As the airplane climbed in a nose-high attitude, she was unable to see over the nose of the airplane and collided with a stand of tall spruce trees. Witnesses stated that after impact, the airplane descended into the water, resulting in substantial damage to the wings and fuselage. The pilot reported there were no preaccident mechanical malfunctions that would have precluded normal operation. The pilot's failure to maintain clearance from trees during an attempted go-around. 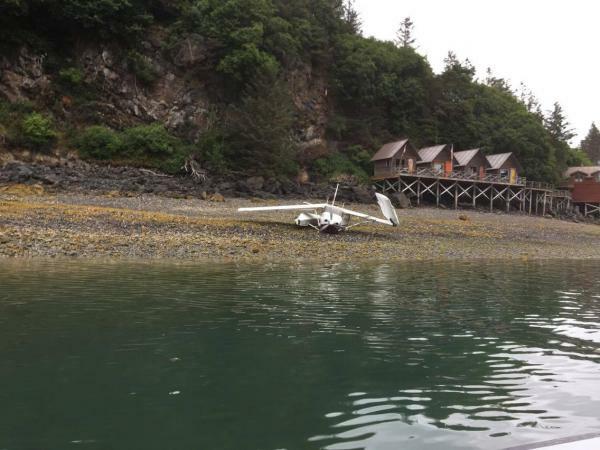 On July 3, 2016, about 1753 Alaska daylight time, an amphibious float-equipped Cessna 206 airplane, N6251K, sustained substantial damage after impacting trees and the tidal ocean waters of Halibut Cove, Alaska, about 11 miles southeast of Homer, Alaska. The private pilot, the sole occupant on board, sustained no injuries. The airplane was registered to Umailik LLC, Anchorage, Alaska and operated by the pilot as a 14 Code of Federal Regulations Part 91 visual flight rules personal cross-country flight. Visual meteorological conditions prevailed at the time of the accident and no flight plan was filed. The airplane departed the Homer Airport (HOM) about 1742 destined for Halibut Cove. A witness described watching the float-equipped airplane as it approached the inland waters of Halibut Cove, and just after the floats contacted the surface of the water, the airplane immediately became airborne again, and it began to climb. When the airplane reached an altitude of about 40 feet above the water, it started a steep left turn and continued climbing until it struck a stand of tall trees. Following the impact, the airplane descended into the waters of Halibut Cove, where good Samaritans came to the aid of the pilot. An additional witness who was on a tour vessel operating in Halibut Cove at the time of the accident stated that, as the airplane flew towards their tour boat, the airplane subsequently made a slight turn towards the vessel before passing off the right side and impacting trees. The airplane then descended into the water, about 100 feet from the tour boat. In the pilot's written statement to the NTSB, she reported that during the accident landing, she inadvertently touched down faster than anticipated, and prior to her expected touchdown point, which caused the airplane to bounce. She wrote that instead of trying to salvage the landing, she attempted a go-around. Due to a high nose up attitude during the climb-out, she was unable to see in front of the airplane and subsequently impacted a tree. The pilot stated there were no mechanical failures that would have precluded normal operation. According to the NTSB form 6120.1 submitted by the pilot, her last biennial flight review was completed September 15, 2013, in the same make and model as the accident airplane. The closest weather reporting facility was HOM, about 11 miles northwest of the accident site. At 1753, a HOM METAR reported in part, wind from 260° at 9 knots, gusting to 14 knots; sky condition, broken clouds at 2,600 ft; visibility, 10 statute miles; temperature 61°F, dewpoint 48°F; altimeter setting 29.92 inches of mercury. 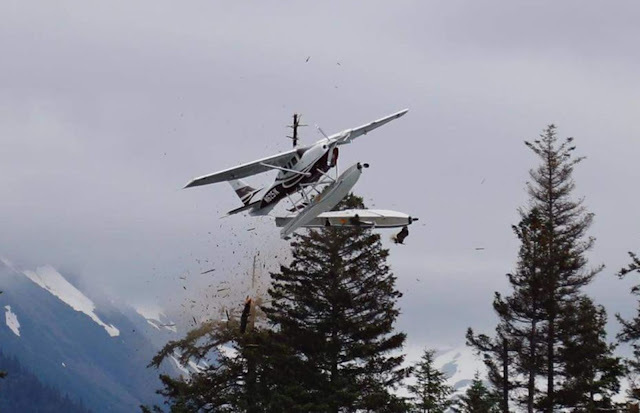 On July 3, 2016, about 1753 Alaska daylight time, an amphibious float-equipped Cessna 206 airplane, N6251K, sustained substantial damage after impacting trees during an aborted landing in the ocean waters of Halibut Cove, Alaska. The private pilot, the sole occupant, sustained no injuries. The airplane was registered to Umailik LLC, Anchorage, Alaska and operated by the pilot as a visual flight rules (VFR) cross-country personal flight under the provisions of 14 Code of Federal Regulations (CFR) Part 91. Visual meteorological conditions prevailed at the time of the accident and no flight plan was filed. The airplane departed the Homer Airport, Homer, Alaska, about 1742 destined for Halibut Cove. 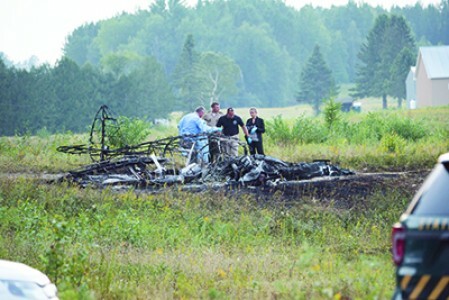 During a series of telephone interviews with the National Transportation Safety Board (NTSB) investigator-in-charge (IIC) on July 4, various witnesses to the accident reported that as the accident airplane approached from the west, it briefly touched down in the calm, glassy waters of Halibut Cove, before becoming airborne again. The witnesses consistently reported that after the airplane began a steep climb to the west, it veered sharply to the left while in a nose high attitude. As the airplane continued climbing in a south-southwest direction, it subsequently struck a large stand of trees on the southern shoreline of Halibut Cove. The witnesses said that during the collision sequence, the airplane's left float was severed, and the airplane immediately descended, nose first, into the waters of Halibut Cove. The airplane subsequently struck the water about 100 feet from a commercial tour vessel that was operating within Halibut Cove. The pilot was able to free herself from the partially submerged and sinking wreckage, and rescuers were able to reach the airplane just moments after the accident and provide assistance. The witness's observations were supported by numerous photographs that were subsequently provided to the NTSB IIC. The closest weather reporting facility is Homer Airport, Homer, Alaska, about 11 miles northwest of the accident site. At 1753, an aviation routine weather report (METAR) from the Homer Airport was reporting in part: wind from 260 degrees at 9 knots, gusting to 14 knots; sky condition, broken clouds at 2,600 feet; visibility, 10 statute miles; temperature 61 degrees F, dewpoint 48 degrees F; altimeter, 29.92 inHg. A 2015 study done for the FAA says accident rates for non-instrument-rated pilots begin to increase shortly after they get their licenses and increase steadily to a peak at about the 500-hour mark before beginning a steady decline. 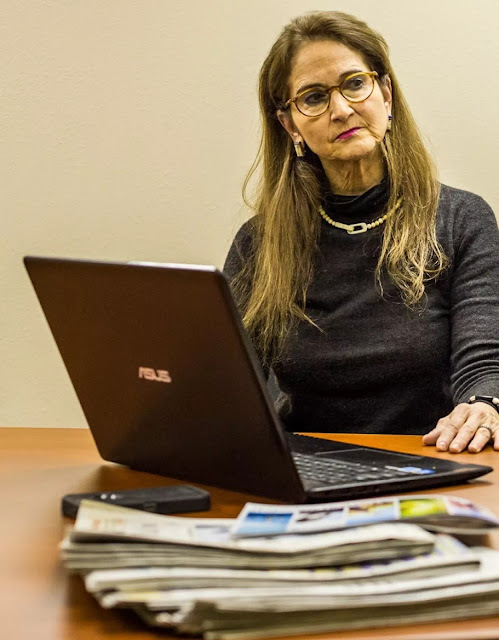 Federal Aviation Administration records reflect Alice Rogoff is no longer certified to fly a floatplane although she still holds a license to fly single-engine wheeled aircraft. As a hazy sun set over the Bering Sea in a blaze of pink glory, a group of weary travelers clustered around a table inside the Twin Dragon, a weather-beaten restaurant on Front Street. It was 15 degrees Fahrenheit outside in Nome, Alaska. Among the diners clad in goose down and fleece was a woman wearing sealskin pants, her sealskin coat with fox fur trim tossed on the back of a nearby chair. She held up a ginger ale. “Here’s to Suzanna, Marc and Loren and Matt of the Alaska Dispatch,” she said, toasting the reporters and photographers who had been following the Iditarod Trail Sled Dog Race over frozen rivers and tundra and icy seas. This was Alice Rogoff, 63, wife of billionaire David Rubenstein and a former Washington business executive turned owner and publisher of Alaska’s largest newspaper. Rogoff had spent nine days piloting her single-engine Cessna 206 from village to village as her reporters covered 70-plus mushers crossing the state. A Chinese restaurant near the northwest corner of the continent might seem an incongruous setting for a onetime Beltway insider often seen at Kennedy Center galas and nonprofit board meetings. But Rogoff, a petite woman with blond-streaked brown hair, seemed in her element. 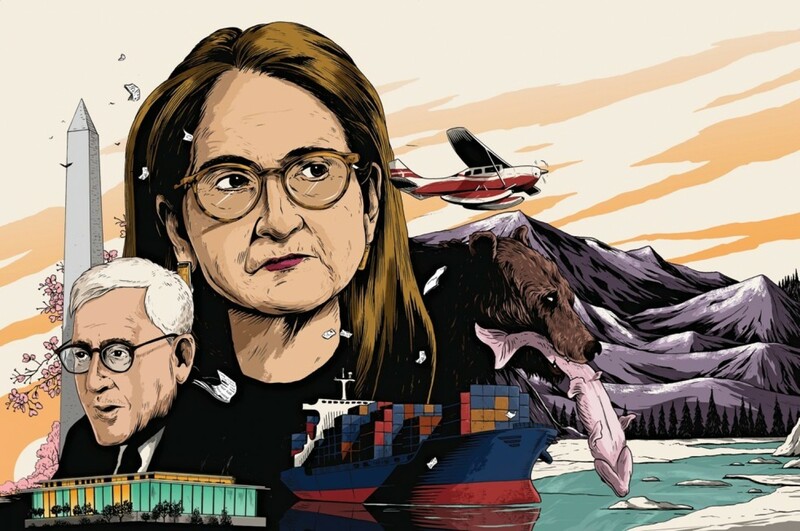 Since her first visit to Alaska in 2001, the intensely private businesswoman and philanthropist has spent more and more time here, starting an arts foundation, buying a house, earning a pilot’s license to more easily traverse the immense state, purchasing a Web site, establishing an organization to address Arctic Circle issues, then buying the former Anchorage Daily News. Yet for someone who has generated so much news, there has been remarkably little published about her. Aircraft, while standing at the dock, wingtip was struck by another aircraft. The pilot reported that the airplane approached the runway with a "steep angle [and] high descent rate." He added that the airplane "touched the ground before flaring" and that the airplane porpoised on the runway. Subsequently, the nosewheel tire popped, and the strut partially collapsed. The pilot reported that he stopped the airplane on the runway and radioed for assistance. The firewall and fuselage sustained substantial damage. The pilot's improper landing flare, which resulted in a porpoised landing. The pilot reported that, the airplane approached the runway with a "steep angle [and] high descent rate." He added that the airplane "touched the ground before flaring" and the airplane porpoised on the runway. Subsequently, the nose wheel tire popped and strut partially collapsed. The pilot reported that he stopped the airplane on the runway and radioed for assistance. On July 5, 2017, about 1440 eastern daylight time, a Piper PA-32-300 airplane, N112DE, performed a forced landing near Rushville, Indiana. The airline transport-rated pilot and two passengers were not injured, and the airplane was substantially damaged. The airplane was registered to Four Aces Escardrille LLC and operated by a private individual under the provisions of Title 14 Code of Federal Regulations Part 91 as a personal flight. Visual meteorological conditions prevailed for the flight, which operated on a visual flight rules flight plan. The flight originated from Fort Wayne, Indiana, at 1312, and was en route to Jeffersonville, Indiana. According to information provided by the pilot, while descending in altitude, the pilot leveled off and the engine did not respond to his throttle input. The pilot selected a diversion airfield and began troubleshooting the engine. The engine would decrease engine power with throttle movement but would not restore engine power when throttle was added. After troubleshooting the engine, the throttle would not advance past ¾ throw and the airplane was unable to maintain its altitude. Unable to make any nearby airfield, the pilot performed a forced landing to a field. The airplane's firewall was damaged during the forced landing. Examination of the airplane found that the throttle control arm was improperly fastened resulting in throttle arm slippage. It could not be determined if the throttle arm was improperly fastened during the last annual. On July 5, 2017, about 1400 eastern daylight time, a Piper PA-32-300 airplane, N112DE, performed a forced landing near Rushville, Indiana. The airline transport rated pilot and two passengers were not injured and the airplane was substantially damaged. The airplane was registered to Four Aces Escardrille LLC and operated by a private individual under the provisions of 14 Code of Federal Regulations Part 91 as a personal flight. Visual meteorological conditions prevailed for the flight, which operated on a visual flight rules flight plan. The flight originated from Fort Wayne, Indiana, at 1312 and was en route to Jeffersonville, Indiana. According to information provided by the pilot, while leveling off the airplane after a descent, the engine did not respond to his increased throttle input. The pilot selected a diversion airfield and began troubleshooting the engine. The engine would decrease engine power with throttle movement, but would not restore engine power when throttle was added. Eventually, the throttle would not advance past "¾ throw" and the airplane was not able to maintain its altitude. Unable to make any nearby airfields, the pilot performed a forced landing to a field. The airplane's firewall was damaged during the forced landing. The airplane was retained for further examination. On July 5, 2017, at 1655 eastern daylight time, a Cessna 182T, C-GBFY, impacted the runway surface when it porpoised during the takeoff roll of a stop-and-go landing on runway 14 at Jackson County Airport-Reynolds Field (JXN), Jackson, Michigan. The airplane sustained substantial damage. The pilot and pilot-rated passenger were uninjured. The airplane was operated by Brampton Flight Centre under 14 Code of Federal Regulations Part 91 as a training flight that was not operating on a flight plan. Visual meteorological conditions prevailed at the time of the accident. The flight was departing at the time of the accident. The pilot and pilot-rated passenger were both students of a pilot training program by Brampton Flight Centre, located in Caledon, Ontario. The purpose of the flight was for the pilot to accrue flight time toward the issuance of a Transport Canada commercial pilot license. The flight originated from Brampton Flight Center about 1300 and was destined to JXN. After arrival at JXN, the flight was to continue to Gary/Chicago International Airport (GYY), Gary, Indiana. According to a Federal Aviation Administration (FAA) inspector from the Detroit (East Michigan) Flight Standards District Office, when the airplane arrived at JXN it touched down near the runway 14 numbers with heavy braking consistent with a short field landing and then took off, for a stop-and-go, on runway 14 (4,000 ft by 100 ft, asphalt), which had 80-foot trees about 2,600 ft from the runway departure end. The pilot submitted three National Transportation Safety Board Accident Pilot/Operator Accident/Incident Reports, form 6120.1, dated from July 12 – July 14, 2017. Each submission followed a conversation that the pilot had with FAA inspector(s), in which the FAA presented their investigative findings to the pilot. The pilot stated in his initial submission of form 6120.1, that he began the takeoff roll and called out "full power confirmed, temperature pressure in the green, airspeed alive." After reaching the rotate speed of 55 knots, the airplane attained liftoff and climbed to an altitude of about 50 ft above ground level before it was unable to climb higher and remained level for about a second. The pilot said that there was no change in airplane attitude that would have been indicative of an aerodynamic stall. He noted that there was a "transient failure" of several Primary Flight Display instruments (red X's over instruments that would not be operational with an inoperative engine but with the battery on). The airplane pitched down and landed nose wheel first despite his attempt to flare. He determined that attempting a landing off the runway would have resulted in an incursion with the trees or vehicular traffic. He set engine power to idle after the first porpoise and flared the airplane to touch down as smoothly as possible after the first porpoise. Upon initial touchdown, the airplane porpoised approximately three times before the pilot regained control and stopped the airplane near the end of the runway. The pilot stated that the engine continued to operate throughout the entire accident sequence, and that he taxied the airplane off the runway, and the engine was shut down after requested to do so by air traffic control. The initial submission of form 6120 had the pilot's recommendation of how the accident could have been prevented. He stated that the Cessna 182T is nose heavy, and that he had witnessed hard landings in the airplane because of landing with the engine at idle power. He stated that if the airplane lands with idle power in normal conditions, the nose will drop first with a more rapid descent in comparison to a Cessna 172. He added that if a Cessna 182T were to lose engine power at a low altitude after takeoff, it would porpoise as the nose would drop aggressively; something he had seen when practicing forced landing approaches or power idle descents in the airplane. On July 13, 2017, FAA inspectors examined the airplane and found that the Garmin 1000 multi-function display did not have an inserted SD memory card. A review of the available maintenance records did not show the aircraft had been updated for the installation of an SD memory card. The nose pitch trim was found in the full-down position. Inspectors applied airplane's battery power and actuated the nose pitch trim through its travel limits and noted that it functioned without anomaly. When one-half of the pitch trim's split-toggle control switch, which was mounted on the pilot's control yoke, was actuated, the trim would not engage, consistent with proper functioning of the control switch. The elevator and ailerons were moved using the pilots (left seat) yoke, which confirmed proper movement of the controls from stop to stop without any evidence of binding or excessive control force. After FAA inspector(s) told the pilot that a post-accident examination of the airplane found the nose trim was found in the full nose-down position, the pilot submitted a second form 6120.1 in which he stated that the autopilot was confirmed to be in the off position twice before landing at JXN and was not engaged for the accident takeoff. The pilot's recommendation in his second submission was he would personally recommend that the electric trim and autopilot be removed. He stated that the trim has a history of running away with the autopilot sometimes performing un-commanded maneuvers and by luck it had happened at high altitudes where recovery was possible; it is a hazard to a pilot who may not be able to recognize it quickly. He said the this was pertinent because the airplane is used by student pilots who may not have the same level of situational awareness just yet. On July 14, 2017, the pilot-rated passenger stated after the airplane came to a full stop, the pilot asked her to retract the wing flaps from 30° to 0°. A full stop was complete, the pilot asked the pilot-rated passenger to retract the flaps to 0°, from 30°. After "deemed all clear for takeoff", full power was applied. The pilot called gauges green, airspeed alive, airspeed in the green, and rotate; the pilot-rated passenger "observed that the calls were correct." During the takeoff roll, the pilot asked for the flaps to be extended to 10°, the pilot-rated passenger was unsure when the flaps locked into place. The pilot-rated passenger had no recollection of the pitch trim being adjusted, after landing and following the accident, from a full nose-down position. On July 18, 2017, the pilot provided a statement to the FAA stating that he did not know the cause of the accident and that his "previous suggestions of runaway trim and power loss are my perceptions at the time of the accident; not personally substantiated." On July 19, 2017, a post-accident examination of the airplane was performed by an airframe and power plant mechanic with inspection authorization under the supervision of the FAA. Flight control continuity, tension, and freedom was confirmed. The control surface deflections for the ailerons, elevator, elevator trim tab, and wing flaps were within limits specified in the airplane's type certificate data sheet. The examination of the Auto Pilot Preflight Self Test performed per 182T NAV III Skylane Information Manual, Supplement 3, pages S3-22 to S3-26. No discrepancies were noted with the autopilot system during the examination. Engine compression from all cylinders was confirmed. Ignition timing was within the engine's type certificate data sheet specifications. Fuel samples taken from the fuel sump drains and header tank revealed no fuel contamination. The engine fuel injector flow and volume were tested, and no anomalies were noted. Examination of the propeller governor adjustment revealed no anomalies. Flap deflection of up to 15° primarily produces lift with minimal drag. The airplane has a tendency to balloon up with initial flap deflection because of the lift increase. The nose down pitching moment, however, tends to offset the balloon." On July 5, 2017, at 1655 eastern daylight time, a Cessna 182T, C-GBFY, impacted the runway surface when it porpoised during the takeoff phase of a stop-and-go landing on runway 14 at Jackson County Airport-Reynolds Field (JXN), Jackson, Michigan. The airplane sustained substantial damage. The pilot and a pilot-rated passenger were uninjured. The airplane was operated by Brampton Flight Centre under 14 Code of Federal Regulations Part 91 as a training flight that was not operating on a flight plan. Visual meteorological conditions prevailed at the time of the accident. The flight was originating at the time of the accident. Post-accident examination of the airplane revealed that the pitch trim was in the full nose-down position, and there were no mechanical anomalies that would have precluded normal operation. The pilot-rated passenger stated that the flaps were selected to 10-degrees during the takeoff roll. The glider pilot reported that, while maneuvering about 10,000 ft mean sea level he “lost control,” and the glider went into a spin, followed by a spiral. He added that he egressed from the glider, deployed his parachute, and was later rescued. The glider impacted terrain and was destroyed. The pilot reported that there were no preaccident mechanical failures or malfunctions with the glider that would have precluded normal operation. The pilot’s failure to maintain the proper airspeed and his exceedance of the glider’s critical angle of attack, which resulted in a stall/spin. The glider pilot reported that while maneuvering about 10,000 ft. mean sea level he "lost control" and the glider went into a spin, followed by a spiral. He added that he egressed from the glider, deployed his parachute, and was later rescued. The glider impacted terrain and was destroyed. Crashed into trees and burned under unknown circumstances. ISLAND POND, Vt. — Officials are investigating a fatal airplane crash. Emergency officials were notified around 3:45 p.m. Saturday of a large fire about 100 yards from the John H. Boylan Airport runway. Emergency crews found a small single-engine aircraft had been badly burned. The sole occupant of the plane was found dead, Vermont State Police said. Officials are working to confirm the individual's identity. National Transportation Safety Board and Federal Aviation Administration officials are expected to be at the scene Sunday. The pilot of the tailwheel-equipped airplane reported that, during the landing roll, the airplane veered to the left off the runway. He added that he applied full power and "managed to maneuver the plane out of the ground loop but started taking out runway lights" as he maneuvered the airplane back toward the runway. The airplane impacted a runway light and two taxiway signs, damaging the main landing gear. The airplane then "flew over the runway," landed, and the main landing gear collapsed. The airplane sustained substantial damage to the fuselage and left wing lift struts. The pilot's failure to maintain directional control during the landing roll. Loss of control during landing is one of the leading causes of general aviation accidents and is often attributed to operational issues. Although most loss of control during landing accidents do not result in serious injuries, they typically require extensive airplane repairs and may involve potential damage to nearby objects such as fences, signs, and lighting. Often, wind plays a role in these accidents. Landing in a crosswind presents challenges for pilots of all experience levels. Other wind conditions, such as gusting wind, tailwind, variable wind, or wind shifts, can also interfere with pilots’ abilities to land the airplane and maintain directional control. Evaluate your mental and physical fitness before each flight using the Federal Aviation Administration’s (FAA) “I'M SAFE Checklist." Being emotionally and physically ready will help you stay alert and potentially avoid common and preventable loss of control during landing accidents. Check wind conditions and forecasts often. Take time during every approach briefing to fully understand the wind conditions. Use simple rules of thumb to help (for example, if the wind direction is 30 degrees off the runway heading, the crosswind component will be half of the total wind velocity). Know your limitations and those of the airplane you are flying. Stay current and practice landings on different runways and during various wind conditions. If possible, practice with a flight instructor on board who can provide useful feedback and techniques for maintaining and improving your landing procedures. Prepare early to perform a go around if the approach is not stabilized and does not go as planned or if you do not feel comfortable with the landing. Once you are airborne and stable again, you can decide to attempt to land again, reassess your landing runway, or land at an alternate airport. Incorporate go-around procedures into your recurrent training. During landing, stay aligned with the centerline. Any misalignment reduces the time available to react if an unexpected event such as a wind gust or a tire blowout occurs. Do not allow the airplane to touch down in a drift or in a crab. For airplanes with tricycle landing gear, do not allow the nosewheel to touch down first. Maintain positive control of the airplane throughout the landing and be alert for directional control difficulties immediately upon and after touchdown. A loss of directional control can lead to a nose-over or ground loop, which can cause the airplane to tip or lean enough for the wing tip to contact the ground. Stay mentally focused throughout the landing roll and taxi. During landing, avoid distractions, such as conversations with passengers or setting radio frequencies. The FAA’s “Airplane Flying Handbook” (FAA-H-8083-3B), chapter 8, “Approaches and Landings,” provides guidance about how to conduct crosswind approaches and landings and discusses maximum safe crosswind velocities. The handbook can be accessed from the FAA’s website (www.faa.gov). The FAA Safety Team (FAASTeam) provides access to online training courses, seminars, and webinars as part of the FAA’s “WINGS—Pilot Proficiency Program.” This program includes targeted flight training designed to help pilots develop the knowledge and skills needed to achieve flight proficiency and to assess and mitigate the risks associated with the most common causes of accidents, including loss of directional control. The courses listed below can be accessed from the FAASTeam website (www.faasafety.gov). The Aircraft Owners and Pilots Association Air Safety Institute offers several interactive courses, presentations, publications, and other safety resources that can be accessed from its website (www.aopa.org/asf/). The NTSB’s Aviation Information Resources web page, www.ntsb.gov/air, provides convenient access to NTSB aviation safety products. The NTSB presents this information to prevent recurrence of similar accidents. Note that this should not be considered guidance from the regulator, nor does this supersede existing FAA Regulations (FARs).